Saturday, August 4, 2001, 7:30 p.m. 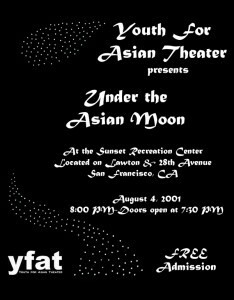 Youth for Asian Theater is a student-run organization that seeks to promote pride in Asian heritage through theater. YFAT operates entirely through the efforts of its young cast and crew members, who oversee the production from script to stage.